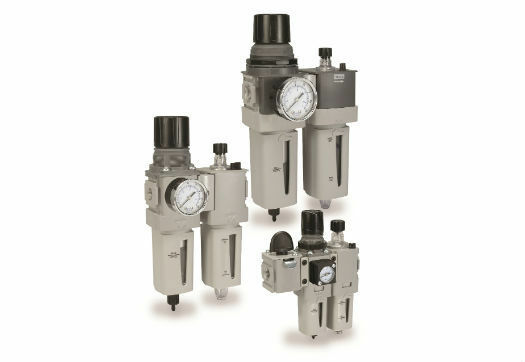 OLDENZAAL (NL) - Parker, the global leader in motion and control technologies, has evolved its popular Global Filter Regulator Lubricator (FRL) air preparation systems, specifically the integral threaded P31 ¼” ported and P32 ¼” to ½” ported series, to deliver excellent flow to size ratios with a new aesthetically pleasing and modern look to complement the latest machinery designs. This next generation of FRL systems can deliver up to 10 bar of pressure as standard (polycarbonate bowl) and, with the addition of an aluminium bowl, they can deliver up to 17 bar, ensuring high performance pneumatic systems perform at their best. As one of the most compact modular products on the market, the units can now be comfortably specified in applications where larger FRL systems previously could not be accommodated due to space restrictions. Constructed from robust yet lightweight aluminium, the new designs are modularly compatible with the existing Parker Global FRL series using patented modular connection system, with high levels of standardisation throughout. They also offer high efficiency elements as standard and excellent water removal capabilities, featuring a positive bayonet latch to ensure a fast, secure and safe fitting every time, allows the filter element cartridge to be changed using only one hand. Nitrile rubber (NBR) diaphragm and seals are deployed throughout. Suitable for a wide variety of applications and conditions, the FRL P31 Mini series can operate between -10°C and 52°C as standard and can be extended to operate equally as effectively at 65.5°C when using an aluminium bowl. Similarly, the FRL P32 Compact series can operate between -25°C to 52°C as standard with the same extension to 65.5°C with the aluminium bowl. Versions capable of operating at temperatures as low as -40°C will be available soon. Full-flowing gauge ports are available on the P31 and P32 products that enable them to be used in additional applications within the pneumatic system. For systems that are security sensitive, tamperproof and lockable kits are available options for regulators and filter regulators on both series. The P31 series also features an optional coalescing filter, which can be fitted with or without a differential pressure indicator (DPI). There are also a range of choices available for the P32 series, including regulators and filter regulators that can now be fitted with round and square pressure gauges and pressure adjustment now comes with T-bar options. Semi-precision regulators and filter regulators are also available, which utilise a smaller valve head and machined seat insert for lower differential pressure, allowing for more precise adjustment. As the issue of increasing personnel safety in the workplace becomes more important for machinery manufacturers, CAT 4 / CAT 2 redundant safety valves are available and are modularly compatible. These work in conjunction with the Global FRL series to ensure conformity to the latest EC Machinery Directive. Fast cycle times, high product quality and low downtime all require a clean, dry pneumatic system to function properly. The next generation of Parker’s Global FRL systems lead the industry with easy to install and maintain modular assemblies that deliver application performance when you need it, wherever you need it.